On Oct. 25, 2018, Bill C-65, An Act to amend the Canada Labour Code (harassment and violence), the Parliamentary Employment and Staff Relations Act and the Budget Implementation Act, 2017, No. 1, received Royal Assent. The act amends the Canada Labour Code, and the Parliamentary Employment and Staff Relations Act (PESRA). 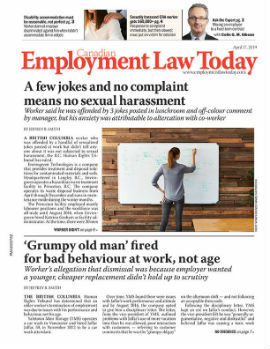 For all non-parliamentary federally-regulated employers, the significant aspects of Bill C-65 are obviously those that affect the code. While the above is a non-exhaustive list, it is clear that federally-regulated employers will have significant obligations when the act comes into force (on a day yet to be proclaimed). While those employers can likely look to their contemporaries in provincial jurisdictions with similar legislation for a general direction, proper consideration of each of the specific obligations will be important to ensure that all obligations are met going forward. Kelsey Orth is an associate practicing employment and labour law with CCPartners in Brampton, Ont. He can be reached at (905) 874-9343 ext. 225 or korth@ccpartners.ca.